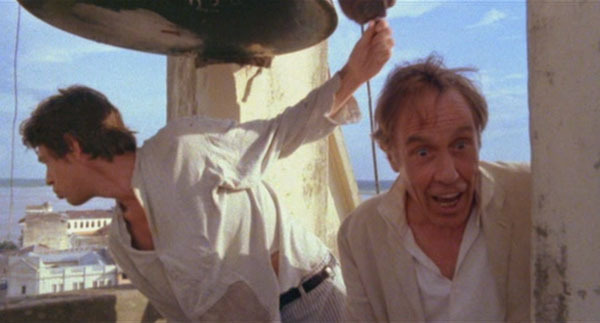 Klaus Kinski (the year after starring in Terayama Shuji’s Fruits of Passion) acts less crazy than usual as Fitz, though he’s still got that hair. And of course, his crazy actions speak for themselves. 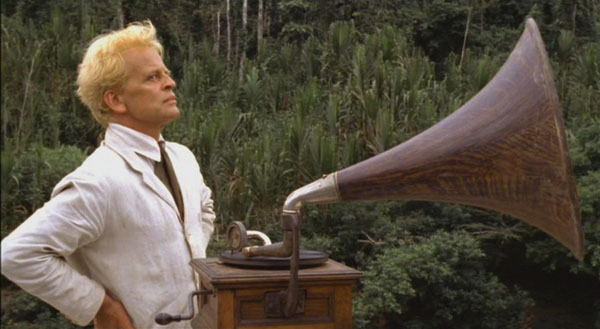 Fitz loves opera, especially the singer Caruso, whose records he collects (which places the action somewhere 1905-1915ish) and wants to build an opera house where he lives in Iquitos, Peru, but investors won’t be convinced. So Fitz decides to make a fortune as a rubber baron, and build his own damned opera house. Gets his brothel-running girlfriend Claudia Cardinale (over a decade after her heyday in Once Upon a Time in the West, 8 1/2, The Leopard) to front him a steamboat and claims an unharvested plot of riverfront land in the jungle. It’s unharvested because nobody can reach it… it lies upstream from dangerous rapids. But even further upstream, another river veers within half a mile of the river in question, so Fitz plans to sail up THAT (dangerous-native-infested) river, drag his boat onto land across into the other river and harvest his rubber. Along with a half-blind but navigationally-keen captain, a drunken chef, and a mechanic (Miguel Ángel Fuentes, fresh from playing the mystical indian sidekick in Puma Man) who’s openly spying on Fitz for his competitors, Fitz makes it to the crossing and with the help of hundreds of natives, drags his 30-ton ship over a damned muddy mountain and into the other river. That night, after the drunken celebration party, the natives cut the ship loose as a sacrifice to the rapids, undoing months of work. In a wonderfully bittersweet finale, with what’s left of his capital Fitz hires the opera to come to Iquitos and perform from the ship. Shot realistically, naturally taking its time to unfold. 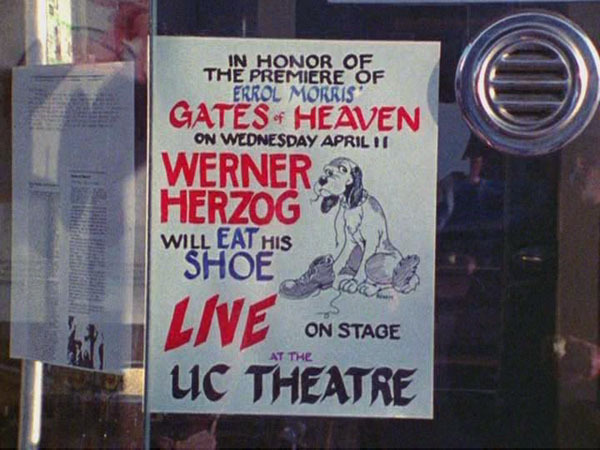 Herzog’s/Fitz’s ambition is immeasurable, and so a mere two hours cannot contain it. Movie doesn’t seem long so much as… huge. Actors speak English, dubbed into German and subtitled back into English. Hey wow, it was shot by the guy who did Orson Welles: One Man Band, which is the other movie I considered watching tonight. 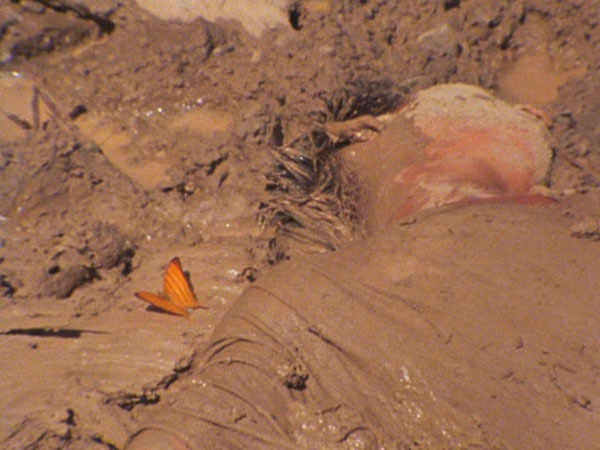 He also shot bunches of Alexander Kluge films. 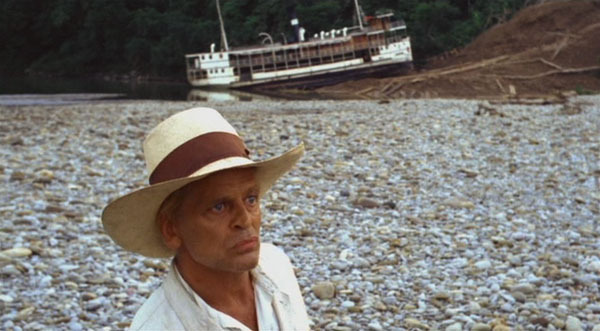 One of the most amazing docs I have seen, and essential viewing with Fitzcarraldo. Shows and tells the factors that made that film define “troubled production”, making Terry Gilliam and Francis Ford Coppola look like pansies in comparison. Attacks and intimidation by natives (their camp is burned down, a spear attack injures three), losing both stars of the film (post-Melvin and Howard Jason Robards and pre-Tattoo You Mick Jagger) and the actual pulling of a 30-ton steamship over a mountain by natives doesn’t even cover the whole story. 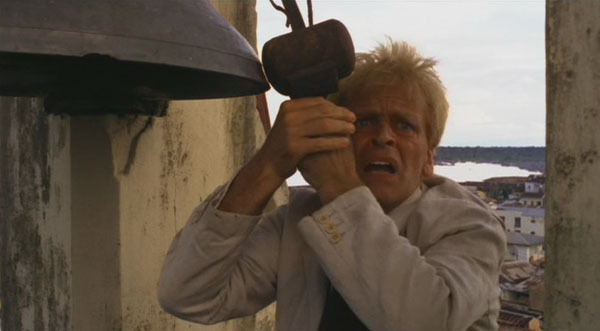 On-set tantrums by a bored Klaus Kinski aren’t in this film (presumably they’re covered in My Best Fiend). This doc itself is wonderfully well-paced and shot, and Les gets choice interviews with Herzog, including his oft-quoted bit about how the jungle birds don’t sing, “they just screech in pain.” Taken as a package, Fitz and Burden are the rare cult films which exceed their reputation. When production stalls, as it often does—Herzog claims his film is “cursed,” admitting that “the jungle is winning”—Blank filters in lively scenes of the Campa extras’ quotidian routines: food preparation, clothes washing, the blending of a local alcoholic drink made from yuca plants. It is significant that most activities are “women’s work,” a realm that Herzog’s masculinist vision rarely acknowledges. Later, Blank constructs a touching vision of cross-cultural identification by juxtaposing the sound of a Caruso aria coming from a record player in an earlier shot with loving close-ups of native women, as if they are responding to the beauty of this alien voice. The moment recalls an archetypal collision staged by romantic adventurer Robert Flaherty in Nanook of the North (1922), when the titular Eskimo marvels at a phonograph record (then jokingly decides to bite it). 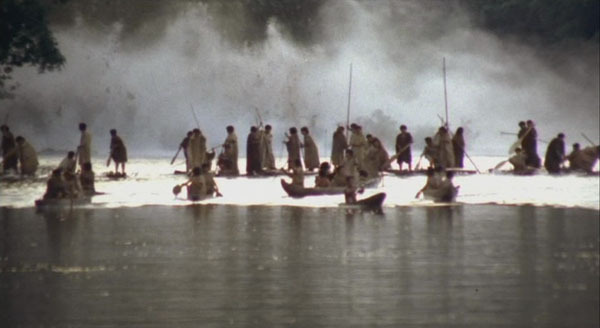 Unlike either Herzog or Flaherty, Blank clearly prefers the rhythms of collective effort, of sensuous community, over Eurocentric ideals of heroic individualism. In essence, he has crafted a film about the interaction of premodern tribal existence with European modernity, epitomized by a movie narrative about the invidious clash of brute nature and a singular ego bent on his own, ultimately delusional, mission of cultural enlightenment.